Today the Office 365 team announced the rollout of the first phase of the Groups feature. I hadn’t been playing close attention to the roadmap for this particular feature, so I decided to play around with it and report my findings. Rather than the kind of carefully reasoned analysis you might expect from Tony or Van Hybrid, this is sort of a stream-of-consciousness record of my initial exploration. However, it probably reflects how most customers will discover and use the feature. Remember that this is written within a few hours after the feature launched, so things that I call out as not working or missing may not be lit up in my tenant yet. Creating a new group is straightforward. Note that there’s no way to specify an email address for the group object. You can send mail to it from within OWA, or by clicking the envelope icon in the group information sheet, but there’s no visible external SMTP address to, send to. This seems like an oversight. The group documentation says that newly created groups get their own OneDrive for Business folder and group mailbox, but I haven’t yet seen any signs of those objects in my tenant. However, the docs also say that group members will get a “welcome to your new group” email once those objects have been created, and because that hasn’t shown up yet, I’m guessing that there’s just a short provisioning delay. I created a new group named “Managing Consultants”. I picked that name on purpose, because I already had a mail-enabled security group with the same name. The Groups interface happily let me create a duplicate. The existing USG doesn’t show up in the Groups interface in OWA, nor does the new Group show up in Outlook’s online GAL (which may just be an artifact of AD latency). The help topic for creating and navigating groups shows a number of settings that aren’t visible in my tenant. For example, you can supposedly change the URL used to access the group or set the group to either private or public– those options aren’t available to me yet. I clicked on the mail icon to create a message and sent it off; it arrived immediately in the target mailboxes. Interestingly, though, the group name doesn’t show up in Outlook; instead, the individual group members’ names appear. 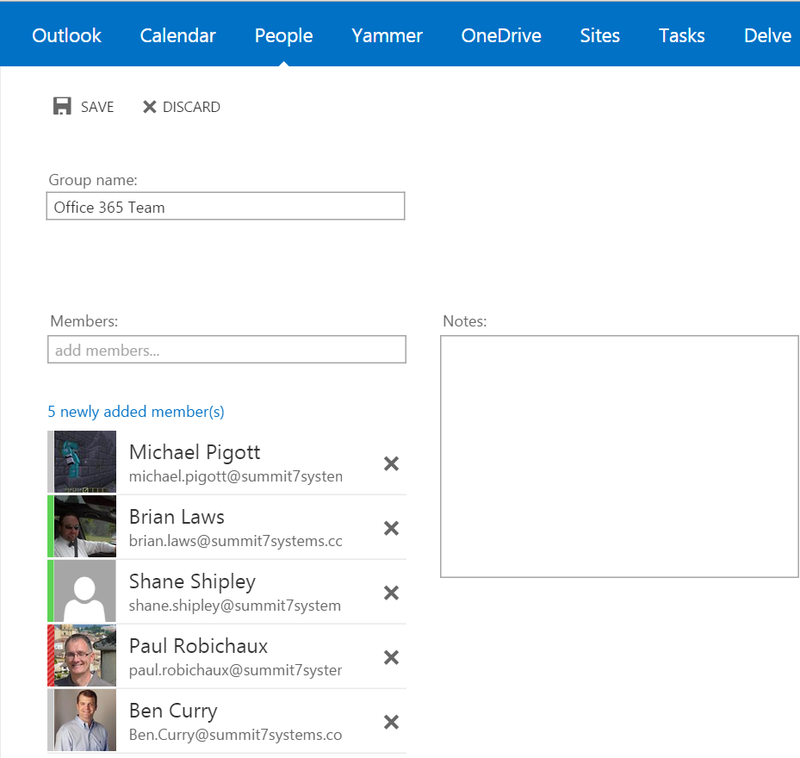 Bizarrely, clicking the “Browse groups” item opens a new OWA window, which opens in mail view, not the People view. The new OWA window’s left nav bar has a People section, but it’s empty– even though the original OWA window I kept open still correctly shows unread mail from people in my Inbox. 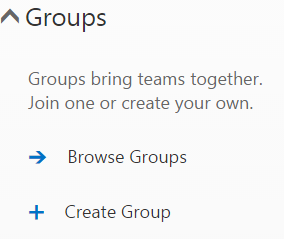 When I create a Group, it doesn’t appear as an available group in Yammer. I presume this is by design. I didn’t test Group conversations because there are no visible Group objects in OWA where the docs say they should be. From the bumpy state of feature display and behavior at this point, I infer that there’s a multi-step provisioning task that runs when a new Group is created, and that at least the ODB step hasn’t run yet. This might confuse users who wonder why they can use a group for one purpose (sending mail) but not another (ODB). I’ll wait a day or so for the provisioning and loop back to see which of these items are bugs and which are just caused by setup delays. I’ve been checking this out, too. Are you sure that groups functionality in People is new? I hadn’t noticed it before either but it doesn’t match what I saw in the announcement or the help docs very well. I think I may have just been a too-early adopter, because this morning I found that the Groups I created yesterday were gone. When I created a new Group this morning, I got the welcome message and the UX as described in the documentation. It must have just been a burp. Interesting. I wonder if the same will happen for me tomorrow! I followed your steps and it looks exactly the same to me today as you describe in this post.